A marvel of engineering and design, the Mavic Air was built to go wherever adventure takes you. This next evolution of DJI’s compact and foldable Mavic series inherits the groundbreaking features of its predecessors while introducing new flight and shooting modes, multifaceted safety measures, and the most advanced technologies available. The Mavic Air allows professionals, outdoor enthusiasts, and explorers of every kind to let adventure unfold. The Mavic Air is set to release on January 28 for $799. Go to the DJI site for more info. 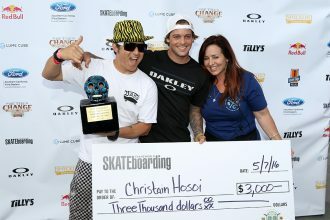 Ryan Sheckler and the Sheckler Foundation hosted their 7th annual “Skate for a Cause” on May 7th,2016 at the etnies Skatepark in Lake Forest….